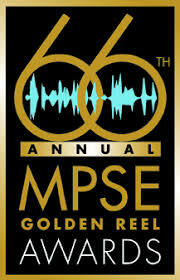 The Motion Picture Sound Editors (MPSE) has announced the nominees for the 66th Annual MPSE Golden Reel Awards. These nominees represent the world’s most talented artists recognized in 23 categories of outstanding achievements in sound editing that encompasses feature films, television, animation, computer entertainment and student work. The 66th Annual MPSE Golden Reel Awards ceremony is to be held on February 17, 2019 at the Westin Bonaventure Hotel in Los Angeles. Tickets for the ceremony can still be purchased. A full list, with individual nominees, will be available on the MPSE website, MPSE.org, on Monday January 21, 2019.